SOS Children’s Village Moscow (previously known as SOS Children’s Village Tomilino) is located in the district of Tomilino about 25 km from the centre of Moscow. It was the first location in Russia where our organisation started providing support to the local children and their families. The population of both Tomilino and Moscow has been growing in recent years. Moscow and its surrounding areas produce around one fifth of the country's gross domestic product. The residents of Tomilino find work in Moscow or are employed in the local enterprises, many of which are involved in scientific research and development. There is also a poultry farm and a textile mill nearby. The sprawling metropolis of Moscow is home to around 12 million people. There are sharp contrasts in the standards of living of its population: on the one hand it is one of the cities with the most billionaires in the world, while on the other hand there has been an increase in the number of people living in poverty. The cost of living has risen in recent years and many families struggle to meet their children's basic needs. As families struggle to make a living, the ensuing stresses and strains often have negative effects on children's lives. Many children end up dropping out of school because they are forced to contribute to the family income. They often end up working or begging on the streets. These conditions have also led to an increase in the number of children who lose parental care altogether. SOS Children's Villages has worked in close collaboration with the Russian authorities, helping to provide support for children who have lost parental care and who have no-one to turn to. The increasing number of children without parental care led to the already underfunded orphanages becoming overcrowded. Russian state policy has recently changed: children should be cared for in family-like settings, rather than institutions. SOS Children's Villages’ model of care is based around small family units and is an environment where children's individual needs can be met. SOS Children’s Villages has been working in Moscow since 1996. Strengthen families: SOS Children's Villages aims to strengthen local families by offering access to essential education, nutritional and health services. We offer support to families who are at risk and enable children to grow up within a caring family environment. Care in families: When children lose parental care they can move into an SOS family where they are cared for by SOS parents. We also have SOS foster families who are living in the village – these families take part in all aspects of life in the village. 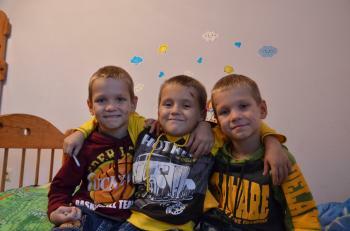 SOS Children’s Villages provides support to these families, and co-funds them along with the Russian state. Some families live integrated in the community, and they are in regular contact with the SOS Children’s Village. The children attend the nearby kindergartens and schools, and take part in local activities. Support for young people: As the children grow older and are ready to leave their SOS families, they can move into the SOS Youth Programme which has been in operation since autumn 2002. While they undergo training or attend further education, the young people are guided on their path to an independent life as, they learn to shoulder responsibility and make their own decisions.